Transcend TS8GMP710K MP710 Black + 8Gb - digital music + FM radio player with G-Sensor step counter + voice recorder, with 2" color TFT LCD (240x320), built-in MiC + 3.5mm line-in for voice/audio/radio recording , 88x44.3x10mm / 39g , earphone with removable earhook + neck lanyard + detachable sport clip Copyright © 2019 ComXpert International CC - COPYING IS ONLY ALLOWED FOR THE PURPOSE OF SENDING US ENQUIRIES. E&OE. Featuring the Line-in function, the MP710 enables you to directly record all the audio files to the music player while listening to video turtorials. It acts as a best companion to maxmize your study efforts. The best price and guaranteed service and backup from official computer suppliers in South Africa for the MP-T710K Transcend MP710 Black 8GB Fitness MP3 Player. 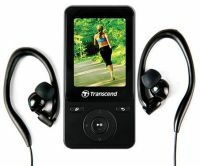 The Transcend MP-T710K Transcend MP710 Black 8GB Fitness MP3 Player is available for R975. The product is sold by ComX Computers as new. Prices are valid today 2019-04-22 (before 2019-04-23 , by quote, while stocks last). The product is expected to be in stock, although this is not guaranteed. Find related MP-T710K Transcend MP710 Black 8GB Fitness MP3 Player products in our MP3 WMA audio players Category for even more options. Read reviews and find out about MP-T710K Transcend MP710 Black 8GB Fitness MP3 Player. Discounts, specials and cheap prices only at ComX Computers.